The most common and ubiquitous type of noodles in not only America, but many other countries as well. Spaghetti (literally "little twines" in Italian) noodles are one of the thicker extruded noodles, and are distinctly larger than their many smaller cousins such as vermacelli (literally "little worms") spaghettini (small, little twines) or capellini (little hairs). These types of noodles are traditionally rolled out, but modern producers of these types of noodles prefer to use extrusion methods to make the noodles in lieu of the traditional rolled method. In this method, a large hopper of dough is forced through the desired size hole to make long, single-strands of noodles, after that, the noodle is trimmed down to a uniform length and dried for packaging. The differences in size are not a very big deal in America, as anything under the size of Spaghetti is typically considered "Vermicelli" by the Food and Drug Administration. In Italy though, there is a very specific set of size ranges that a noodle must meet in order to be classified as that type of noodle. Spaghetti is not limited to the somewhat diminutive size of the Spaghetti noodle. Spaghettoni is the thicker cousin of the familiar Spaghetti noodle, and can be used almost interchangeably in most recipes, the only difference being that Spaghettoni noodle requires much more time to cook to that ideal "al dente" level that is indicative of the "Spaghetti" family of noodle. Al dente (literally "to the teeth") is the method of cooking Spaghetti to the point where it is tender to the tooth, but not soft enough to be too easily cut using teeth. Cooking the noodles to this threshold only requires a pot of salted, boiling water and a keen eye to pull out a sample and bite it. Achieving this threshold will vary widely depending on the brand of noodle one purchased. The types of sauce that can be applied to Spaghetti noodles are only limited to ones imagination, though they are most commonly used in tomato-based sauces. The birthplace of pasta was traditionally considered an import from Asia from when Marco Polo opened up trade with the far east, though newer evidence suggests that some form of egg and flour based noodle has been made in Europe since as far back as 700 B.C., this topic is highly argued amongst culinary historians. Sauces are almost an equal source of contraversy as well. Culinary prescriptivists say that only certain types of noodles may be paired with certain types of sauce, but American kitchens have paid no heed to these largely arbitrary prohititions. Spaghetti itself is considered to be a "red sauce" noodle, but this is mainly due to the predictable cooking time of such a simple shape of noodle. 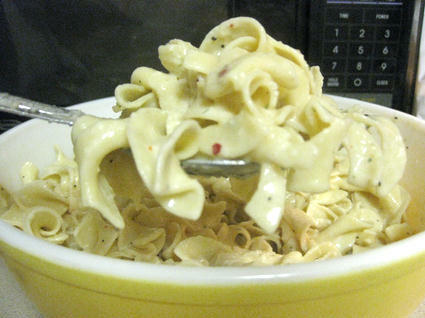 Flat noodles or ones with cavities in the middle are not as consistent in their preparation time, so due to this they are typically used in creamier and thicker sauces. One thing is for sure though, thin noodles are so diverse that one should let their imagination dictate what is best for what. This type of pasta has a couple of useful attributes and therefore can be considered to be much more versatile. Elbow noodles (such as macaroni for one example) have a very short cooking time in comparison to larger, flatter noodles as well as having the ability to be stuffed with a meat, seafood or even vegetable stuffing (such as manicotti). Due to this versatility, these types of pasta make for a very convenient staple to have around and a must have for the budding pasta-phile. Amongst pasta professionals, with "elbow" types too there lies a bit of a controversy: helical pastas like fusilli and rotini are made in a similar fashion, but are often considered in a separate category from the typically fully enclosed elbow types of pasta. It all depends on how one chooses to draw the distinctions. Cooking times can vary widely within this group due to variance in thickness of the noodle. Some styles of noodle can boast many variations that are really only a matter of differences in thickness and length. For example, Penne pasta can be divided into several subcategories: penne rigate, penne lisce, penne zita, pennette, pennoni are just to name a few. Then there are ones that are only different due to the texture and angle at which they were cut: penne and rigatoni really only differ from one and other due to the strait cut of the ends of rigatoni pastas versus the tapered cut of penne pastas. Cooking times and constituents between these two can be sometimes identical. The best advice from the experts is that stuffing these pastas can make for one of the most delicious ways to enjoy a pasta dish, it is also the most time consuming and difficult to make. Even if one chooses to not stuff their elbow pastas, these types' versatility allows them to be boiled and laden with sauce with such little fuss that they can be considered among the most useful pastas to have around. Even without sauce, the application of herbs to oil can even make a light and flavorful dish that almost anybody can make themselves. Helical pastas do not boast this same versatility benefit. Some experts say that helical types of pasta are only good for bold sauces and herb/butter dressings, since it is almost impossible to stuff them due to their open-ended design. Because of this, many purists believe that helical pastas belong to either their own category, or to the "rotelle" category. This controversy is only considered as such in American kitchens, as in Italy it is quite a faux pas to group pastas together in "families" at all. Every type is considered unique and has its own individual strong and weak points. These types of pasta are, first and foremost, almost always extruded, with the exception of those that are only considered in this category because they don't quite fit in any other (like conchiglie and bucatini). The complicated shapes of rotelle, rotini and fiori pastas can only be achieved through mechanized means when produced on a large scale. 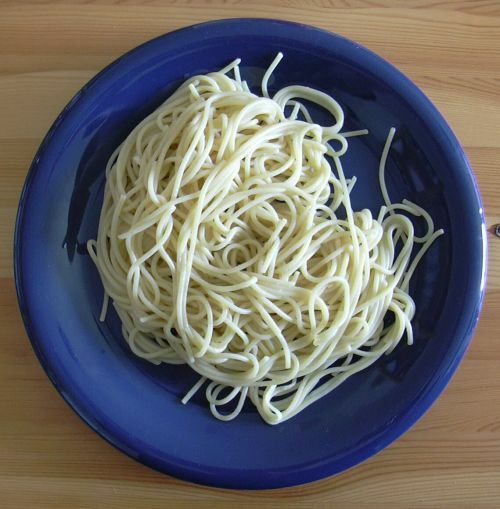 Spaghetti noodles, for example, can be made through rolling and stretching (and indeed purists will agree with this), though they are commonly extruded as well due to production cost management. 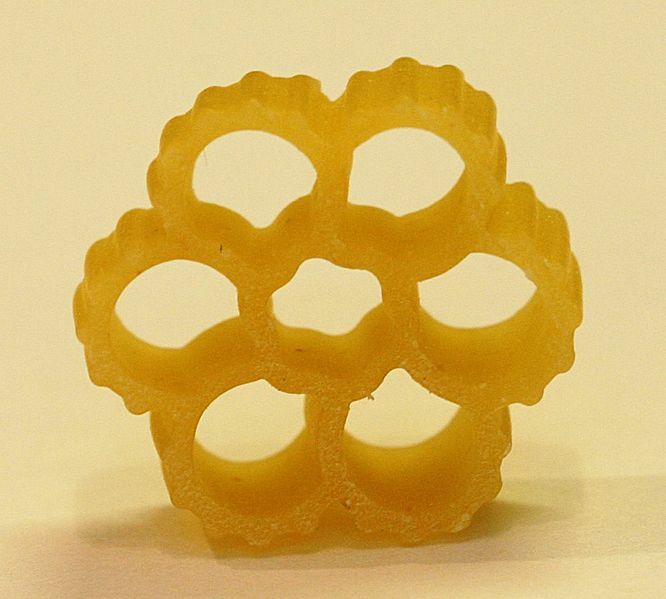 Due to extrusion being almost required, and the unique shapes of these types of pastas, this "group" is often referred to as "irregular" pastas. Though, many members of this group could easily fit into others. Since this category can vary so greatly, it should not really even be considered as a group unto itself, but more of a basis for comparison with other types and styles of noodle. The cooking times of irregular pastas are surprisingly brief considering how dense they tend to be. This is due largely to all the surface area being exposed. There are, unsurprisingly, many subtle differences that can affect the time needed to bring these types of noodles to that much sought after perfect state of tenderness; this is primarily the length of the individual noodle. Pastas like fiori and rotelle have channels running the entire length of the extruded noodle, and can be cut to different lengths. This greatly affects the cooking time because the shorter the noodle is cut, the more surface area is exposed. 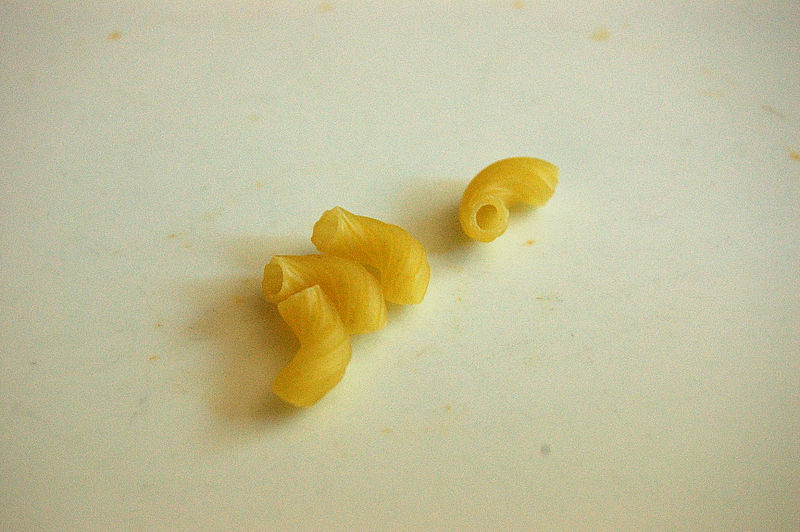 Helical shapes such as rotini and fusilli pretty much always have a very similar cooking time because cutting them shorter doesn't really expose more surface area. Other, less sought after members of this group of "irregular" pastas are plentiful as well, yet are not prized by professional chefs so much as children. These pastas have greatly varying sizes and shapes even in the same batch. Farfalle pasta (or as it is known in America, bowtie pasta) is a square noodle that has been crimped into a shape that resembles a butterfly, hence the name 'farfalle' which means 'butterflies' in Italian. These irregular pastas are the ones that will often boast a variety of colors (red, white and green; the Italian colors) because they can often incorporate tomato or spinach into the noodle dough. Shapes like conchiglie (literally "conch shell") pasta also boast these colorful assortments. Conchiglie is most popular outside of Italy, and is one of the best pastas to hold large amounts of sauce in each individual noodle, yet are almost never stuffed. Bucatini type pastas walk the tenuous line between irregular/extruded pastas and long, thin pastas. They are hollow on the inside, yet long and thin. Even though they are hollow, it would take hours and hours of tedious labor to stuff them without breaking them, and even then their thinness would make any stuffing painstakingly inserted into them break through the noodle easily. Due to this, the delicious bucatini is often overlooked in favor of more easily cooked types of pasta. If what one wishes to make is an oil/herb type of dressing, bucatini would the ideal companion for this sort of dish, and it can even hold lighter cheese-based sauces as well. These are the familiar wide, flat noodles that everybody in any country can identify because of their signature shape and consistency. So far, not much has been said about pasta dishes that can be baked after the noodles have been cooked, that is where this group stands out the most. Lasagna is only one type of the many styles of noodle that all share the similar shape of the ubiquitous lasagna; there is also linguine, fettuccine and mafaldine just to name a few. The one thing that is easily noticeable about these pastas is that they all hold cheese extremely well. As anybody who has ever ventured to prepare a cheese based sauce has learned, that sauce has a tendency to get everywhere and not be easily removed. Because the protein and fat rich sauces are so thick and served so warm, any stray bits of sauce that find their way outside of the desired area will soon congeal and crust into an almost barnacle-tough adhesion. To keep these sauces where they are intended to be, a much heavier noodle is required. As with the thinness of long, thin types of noodle, the wide, flat varieties' cooking time will vary based primarily on the thickness of the noodle. The "average" thickness is about that of the standard lasagna type noodle (of which, of course, there are many variations of as well) is the main determining factor for cooking times. Though, when preparing wide, flat styles of noodle cooking time will run somewhat high. This higher cooking time can sometimes give the noodles a much looser consistency, and make the noodles themselves a bit slimy on the outside. This characteristic makes these noodles the most ideal for baked dishes. When baking noodles, large, flat baking receptacles such as pyrex are the favored the dish known as lasagna. The professional pasta chef will usually always refer to the type of noodle being used in reference to baked pasta dishes, and the blanket term "lasagna" is often scoffed at by the pros. Certainly all styles of pasta can be used in a baked pasta dish, but for best results the use of wide, flat noodles is highly encouraged as they are less likely to lose moisture in the baking process. Losing moisture is a big obstacle to overcome with most baked pasta dishes. Due to this fact, the use of cheese is almost essential in order to "lock in" the moisture. With a layer of semi-impermeable cheese, the moisture immediately seeps back down into the dish. Because of this principle, it is often encouraged to overcook the noodles initially in preparation for the inevitable loss of a significant amount of moisture. These noodles also facilitate the use of an egg wash quite well, though that is a much more advanced technique that wide, flat noodles can be used for perfectly. Members of this family are similar in appearance to the traditional "Spaghetti" noodle shape, albeit with a few deviations, but made from different materials or utilizing different sauces. Typically, these types of noodles are not considered by purists as "pasta", but it would be a grave mistake not to get to know other types of noodle so one can have grounds for a comparison. The primary difference is that non-pasta noodles are mostly not dependant on egg protein as a constituent. 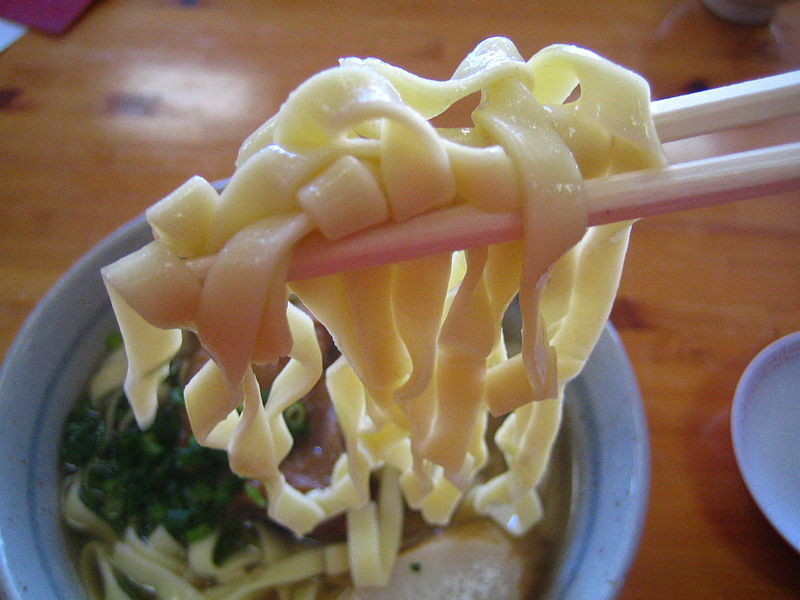 In fact, one of the most famous (and delicious) style of noodle is China and Japan's ramen noodles. These types of noodles mostly use some sort of soda or bicarbonate instead of, or in addition to, egg protein. Knowing about these noodles and how they differ from pasta varieties of noodle is essential for the budding chef or foodie who wants to know everything about what they prepare. Though usually considered as of being solely Italian in origin, long noodles are used throughout the world. In India Spaghetti-sized or smaller noodles are often used as an ingredient in desserts. In China and Japan, Ramen and Soba noodles dominate the culinary landscape. These international variants of the classic Spaghetti noodle can often be made from constituents other than the traditional semolina flour that Italian styles have made to popular. For example, Soba noodles from Japan are made almost entirely of buckwheat. The "sauces" also vary greatly, Indian and Chinese varieties of long, thin noodles usually are eaten with broths and garnished with pickled vegetables or slices of meat. While the genesis of where the long, thin style of noodle remain a mystery, one thing we can all agree upon is they they are delicious and fun to make. No matter what kind of long, thin noodle one chooses to cook, due to the physical shape of the "Spaghetti" style noodles this group is ideal for learning how to cook, but the international cousins of the "spaghetti" noodle are also fun and easy to make. The primary difference one will notice upon venturing beyond traditional pasta is that the sauce is rarely the consistency one will find in abundance in Italian cuisine. For the most part, noodles outside of Italian cuisine will be served in a broth, accompanied by an assortment of meat and/or vegetables. This broth is quite often made from pig bones, radishes and other local products depending on the dish in question. Indian noodles are often served cold with a sweet sauce that could almost be considered a glaze. While Chinese and Japanese styles (such as ramen or soba, or yaki soba) typically boast a piping hot, rich broth made from a wide variety of ingredients. No matter how familiar with noodles one may be, there is always another slight variation on the familiar just waiting to be discovered. The key rule is to try to have fun and be inventive with any attempt at making a noodle based dish. For every rule there is an exception, which makes noodles one of the most versatile staples in culinary history. This article barely scratches the surface to the deep and varying world of noodles and noodle dishes. So the best advice is to try using them in all formats until you are comfortable with the intricacies of each, then the sky and your own imagination are the limits.